2016 was a big travel year for me, by the end of the year I was fortunate to have visited 220 of the 413 National Park Service sites. With the NPS celebrating their Centennial, 100 years, we wanted to celebrate with them. Most I had visited previously, several were first time visits, and every visit brought a special memory. 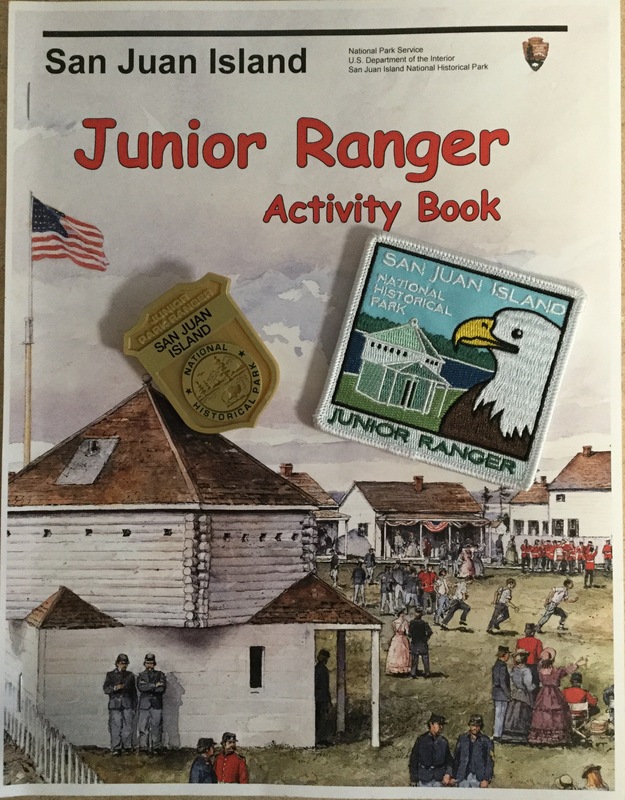 I was thrilled when I learned that a special Junior Ranger Activity Book was available. Looking back at the booklet I completed activities at a number of parks, finally finishing it at El Malpais National Monument in New Mexico. The thirteen activities include; National Park Service Symbols, Jammin’ Journal, Become a Modern Day John Muir!, Draw & Name Your Park, Past and Present Native Cultures, Write a Cinquain Poem, National Park Crossword, My Space – Your Space, Write Yourself into National Park Service History, Healthy Parks, Healthy You, Rappin’ with a Ranger, The President is Calling You, and Protecting Special Places. The inside front cover was not an activity, but asked a couple of questions about birthdays and the centennial. One of the questions was to identify how a park you visited was celebrating the centennial. Five of the parks in southeastern Arizona offered a “I Hike for Health” pins during this year. 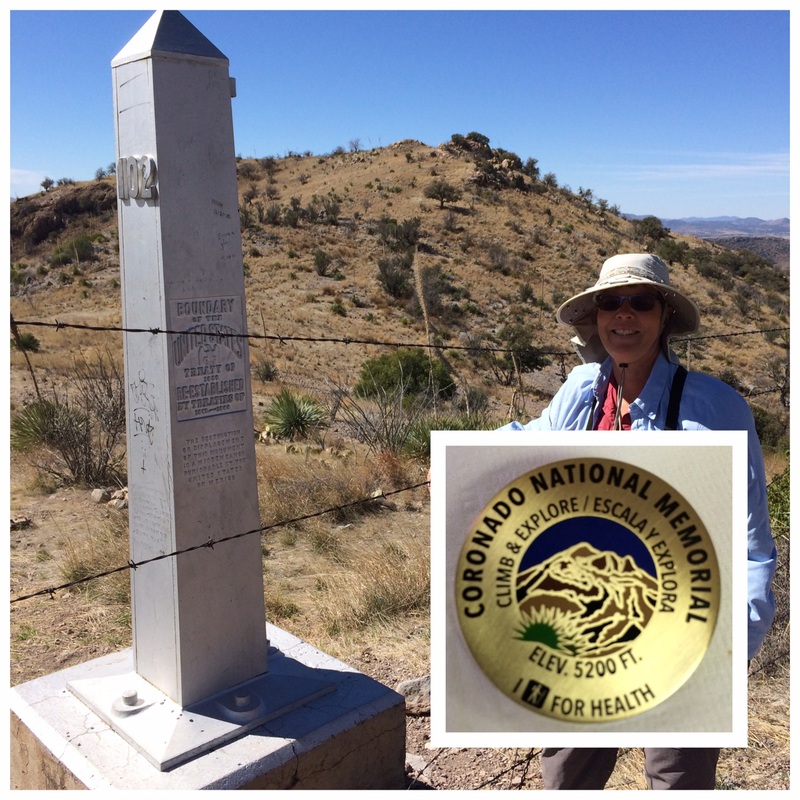 I was able to earn all five pins, including one at Coronado National Memorial by hiking to the US/Mexico border at the beginning of the Arizona National Scenic Trail. Instead of recounting the activities I will share some memories and pictures from my travels during 2016. 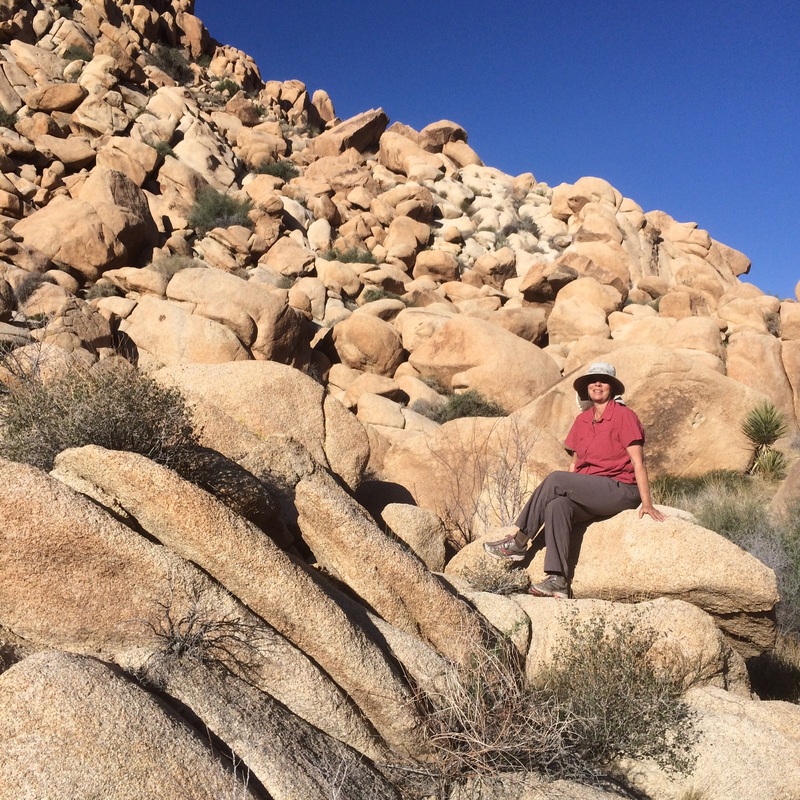 Living in Arizona we have access to some wonderful desert parks which we could enjoy during the winter months. 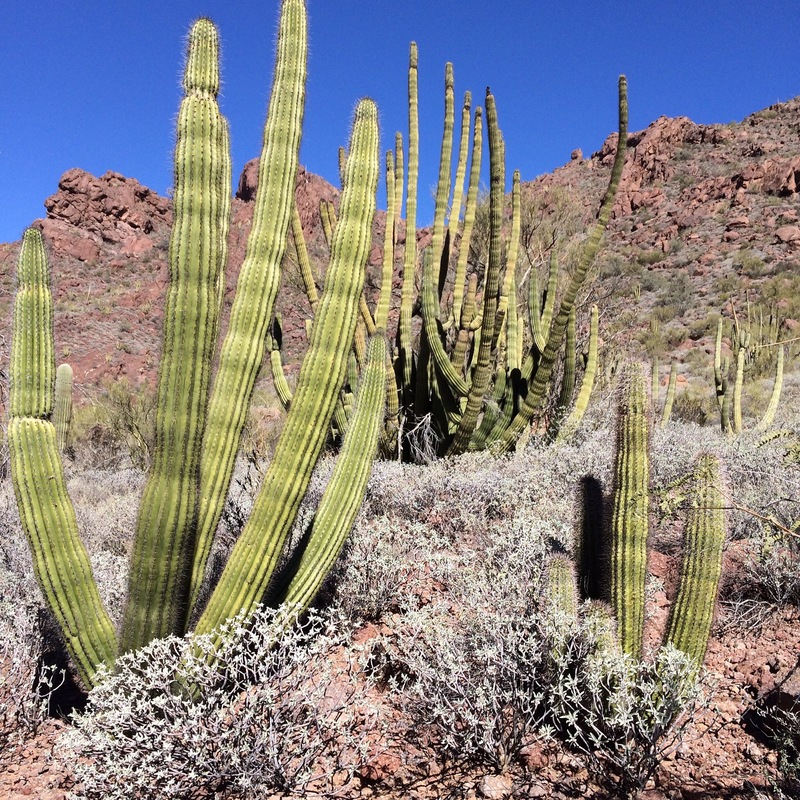 Organ Pipe Cactus NM, Joshua Tree NP and Death Valley NP are sites we have visited many times over the years, and the flowers in 2016 were gorgeous. 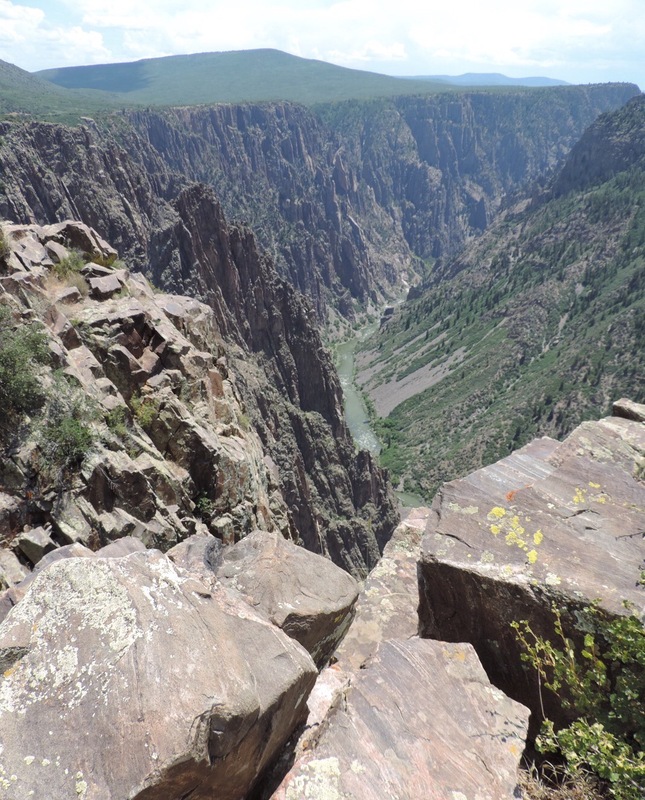 In Colorado there is a wide variety of park sites, from Black Canyon of the Gunnison NP and Great Sand Dunes NP. Both unique and beautiful at any time of the day. 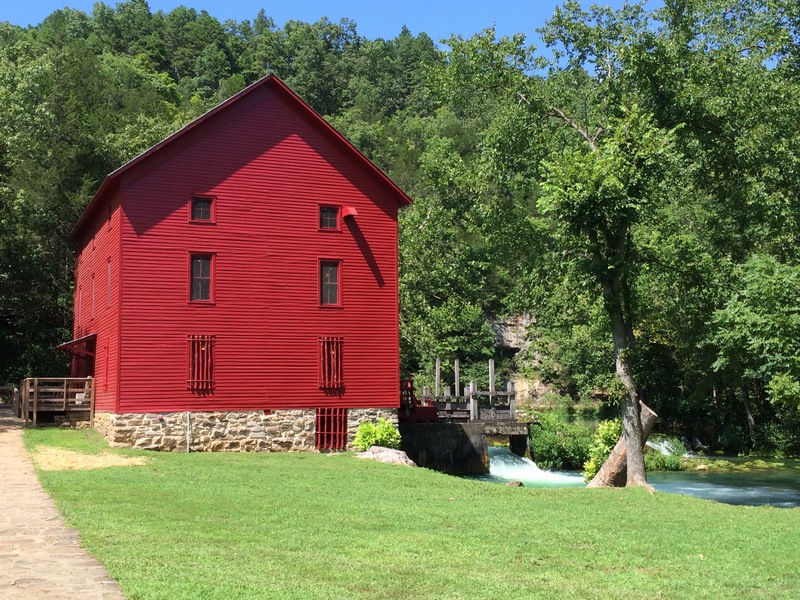 Working back East we spent time at Alley Spring & Mill in Ozark National Scenic Riverway, a built area with gushing water and historic buildings. 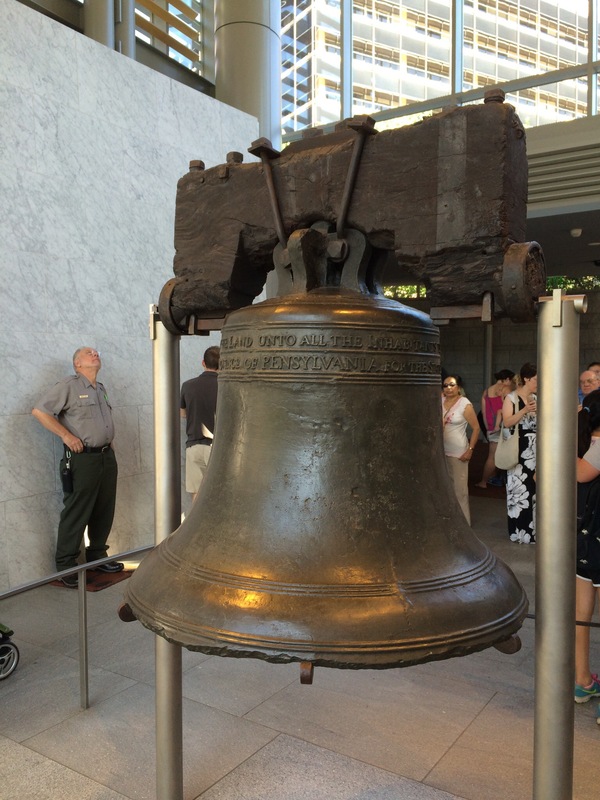 Of course the one of highlights was attending our annual National Park Travelers Club (NPTC) meeting in Philadelphia at Independence National Historical Park, especially seeing the Liberty Bell. 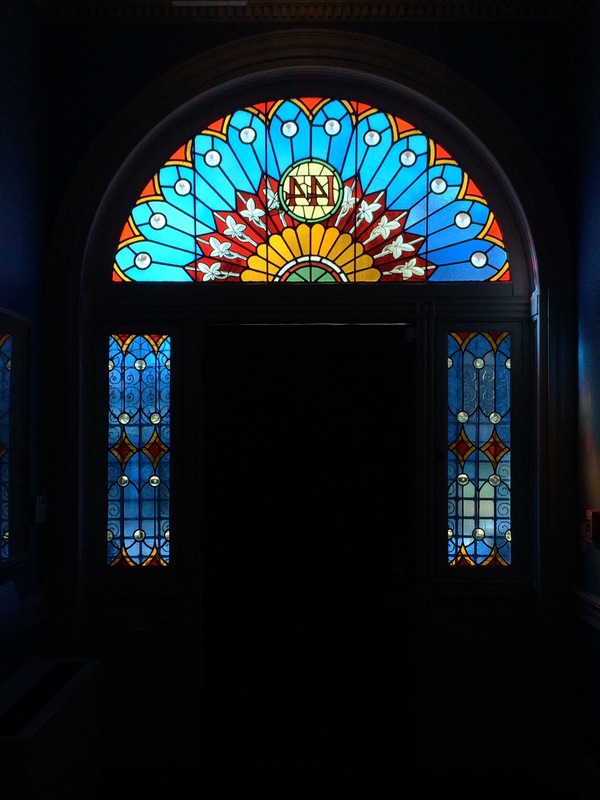 While touring Washington DC I visited the Belmont-Paul Women’s Equality NM where many legislative victories were pursued within sight of the US Capitol, the architecture was stunning. 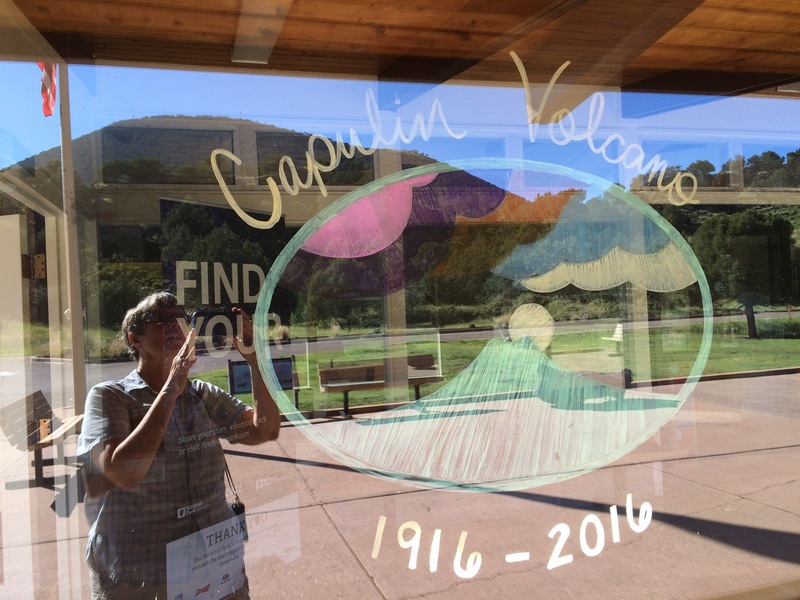 Working our way West came back through Northern New Mexico and celebrated with Capulin Volcano NM -their window was one of many special events and signs we saw throughout the year. 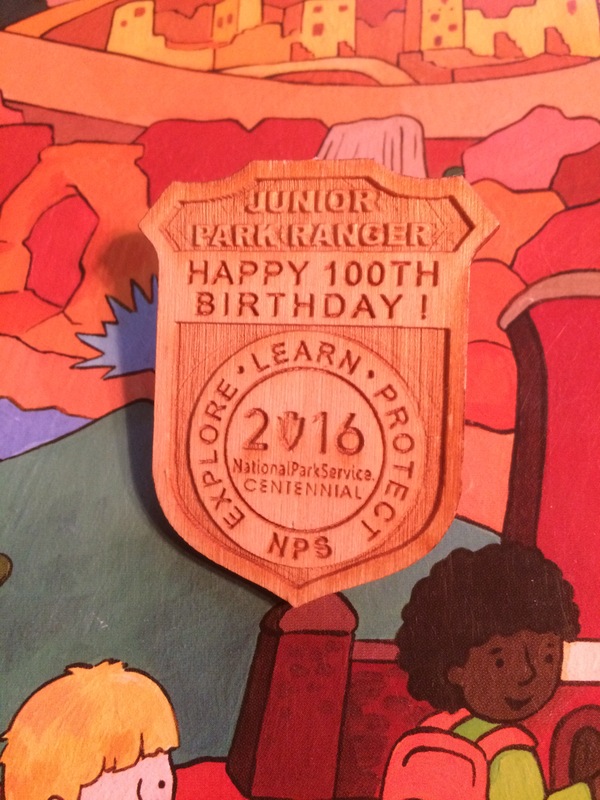 As active members of the NPTC we collect the NPS passport stamps that the sites offer, in 2016 the sites had a special stamp for the Centennial. It definitely made the year extra special as we criss-crossed the country visiting the parks and working on the special Junior Ranger booklet. 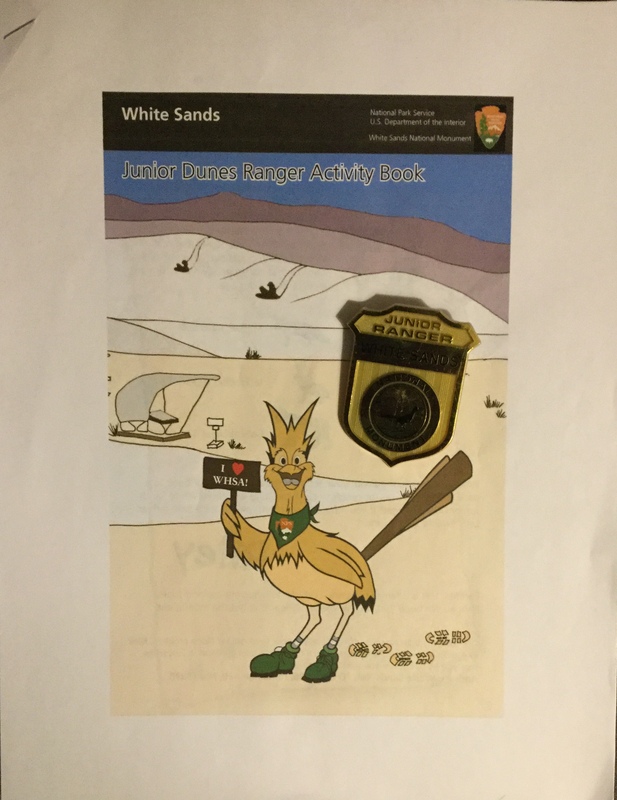 The good news is you did not have to travel as we did, the booklet could be done at home or at one site to earn the wooden Junior Ranger badge. For those who did not know about this program during the centennial year, it may still be available. Check with any NPS site or online. After many visits over the years, I finally completed the Junior Dunes Ranger Activity Book. 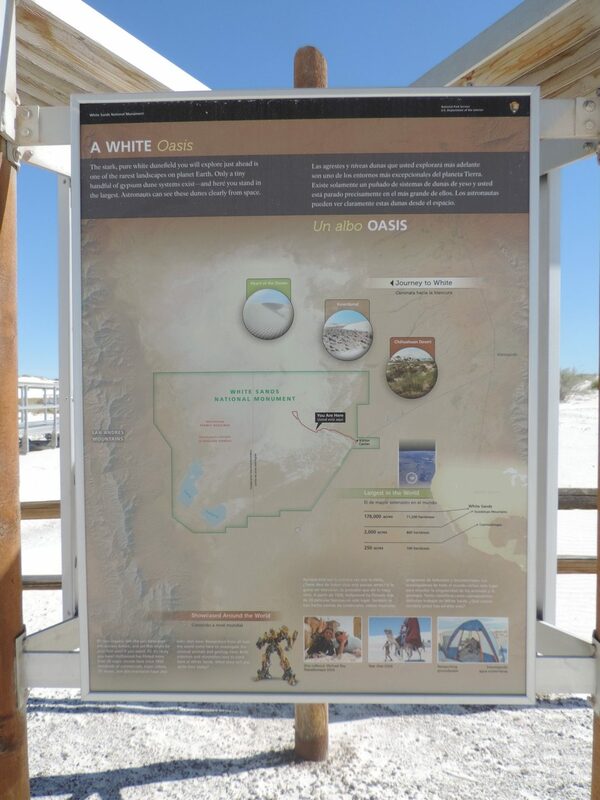 Whether you arrive from the east or west it is spectacular to see the pure white sands in the middle of the Chihuahuan Desert, the largest desert in North America. 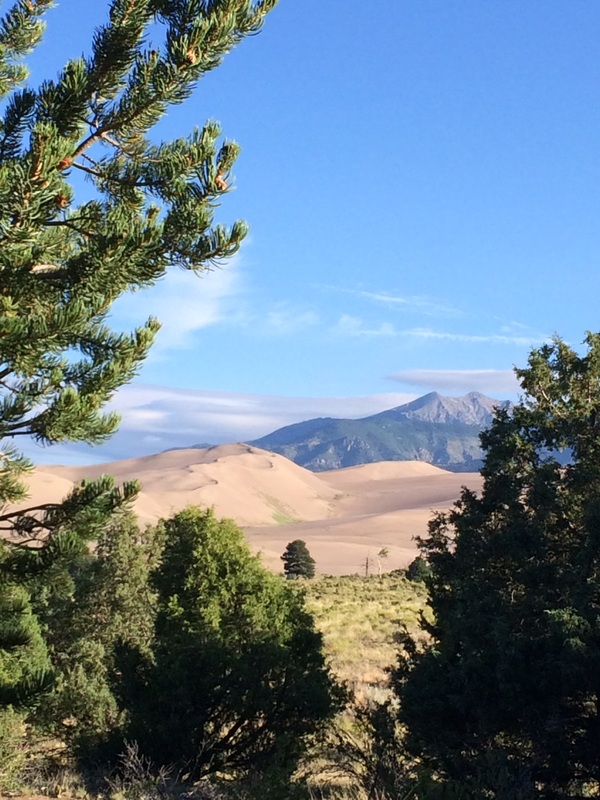 This is a popular park site for families, as you can climb the dunes and slide down. This program is Senior Friendly as there is no upper age limit. Activities include; Recording Your Memories, Having Fun and Being Safe, Solving Riley’s Riddles, Discovering Who Lives Here, Looking for Shapes, Meeting a Ranger, Finding Your Way, Dining in the Desert, Transforming Rock into Sand and Dunes, Exploring the Soaptree Yucca, Meeting the Dunefield, Holding the Dunes Together, Nature and Geology Checklist. The graphics for Transforming Rocks into Sand and Dunes was helpful to understand the sand creating process. 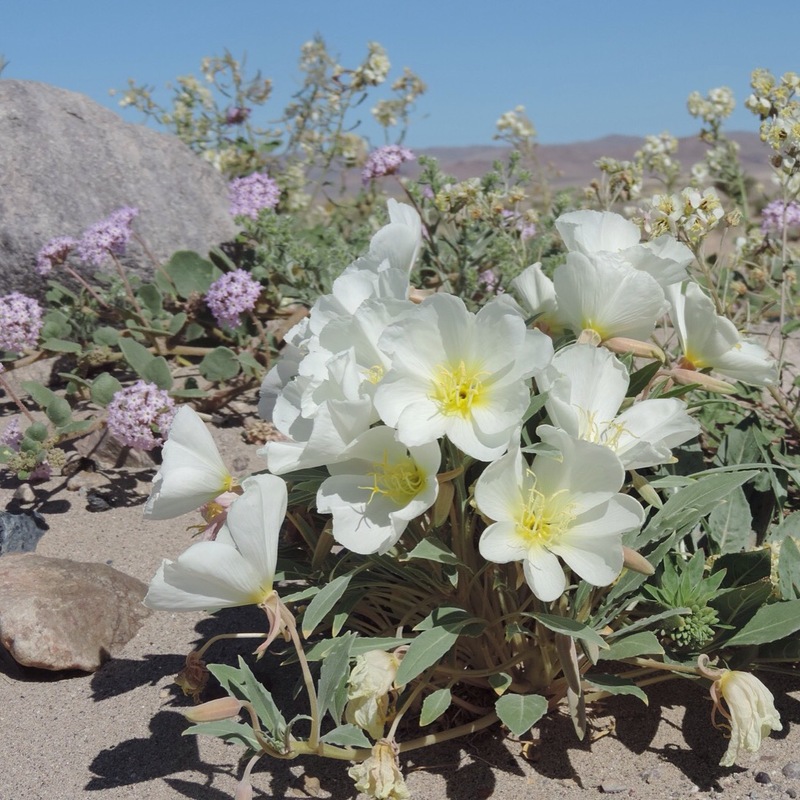 The dunes are stark, and the few plants which grow on the dunes offer special beauty. Exploring the Soaptree Yucca was a good botany lesson. 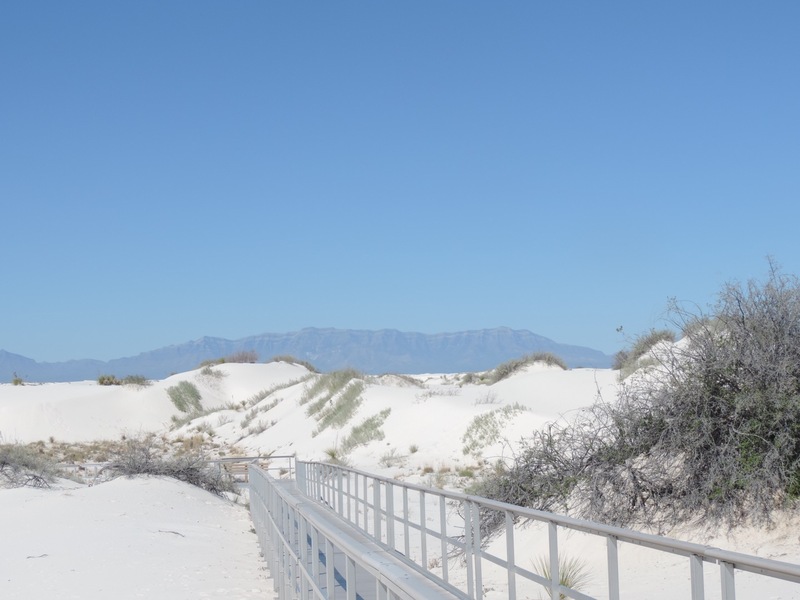 As dry as it appears while visiting White Sand Dunes NM, it is surprising to learn how water is important to creating the dunes. Holding the Dunes Together explains how the water cycle makes these dunes possible. Back in the visitor center the ranger on duty reviewed my booklet and awarded me their enhanced Junior Ranger badge. The badge depicts a Greater Roadrunner, with the dunes in the background. Once again I learned that the booklet available onsite is slightly different than the one I copied from their website. Either booklet will give you an opportunity to explore and enjoy this unique and beautiful site in the center of New Mexico. Be prepared to be amazed – the views, the trails, the lakes, the campgrounds and the plants and animals are all there for your enjoyment. Glacier National Park is big! I have been fortunate to be able to enjoy all sections; west, southeast, east and even a north section when I visited Goat Haunt in 2012. To easily get to Goat Haunt you take a boat tour from Waterton National Park, in Canada. 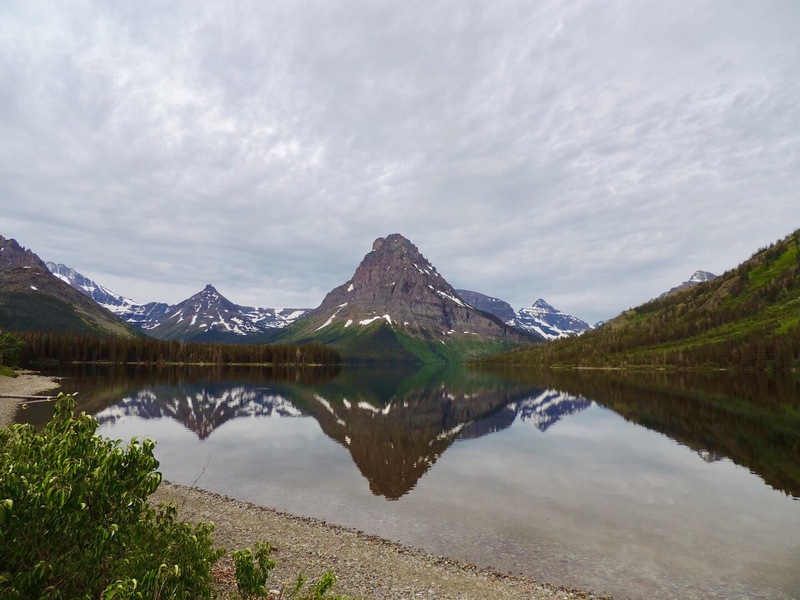 Wherever you find yourself in Glacier – take a deep breath* and take it all in. Their Junior Ranger provides you an opportunity to learn about and experience this spectacular park. This program is Senior Friendly as no age groupings are given. This booklet does separate younger kids activities, from older ones, by designating a bear icon on pages for the younger set and an eagle icon for the older kids. Two activities, The National Park Service and the final activity of the Ranger-led activity or Talk to A Ranger, are required of everyone. Completing at five additional activities, your choice, are required to earn this badge. 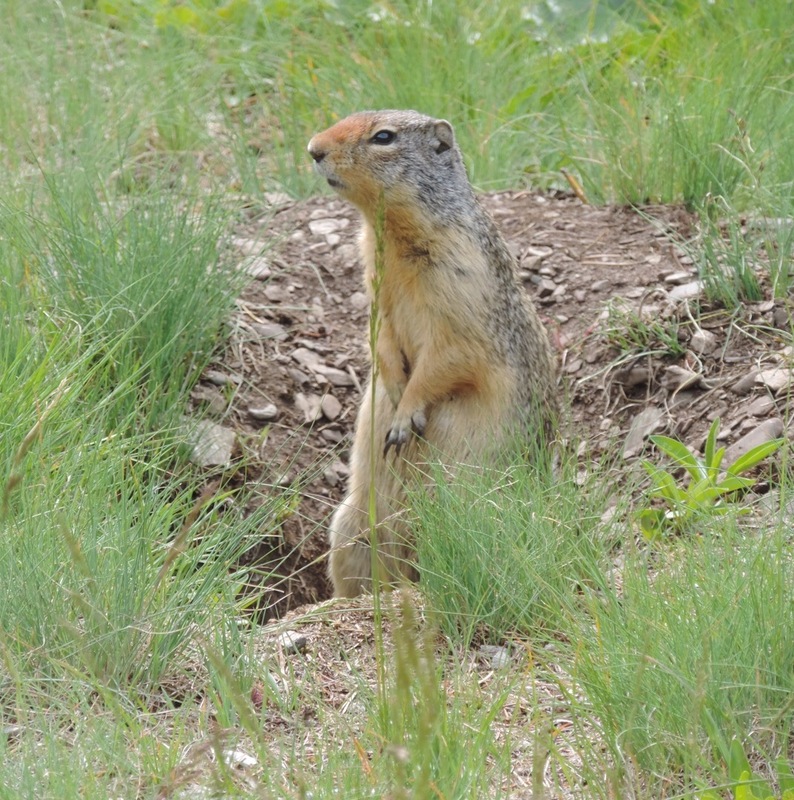 Activities include; The National Park Service, Wilderness, Leave No Trace, Native Names, Habitats Are Homes, Up, Up and Away?, Moving Through Glacier’s History, See America First, Making Peace, Four Nations Working Together, Disappearing Glaciers, Geology Hunt, Wise About Wildlife, Living Lightly and Attend a Ranger-led program or Talk to a Ranger. The activity Native Names highlights the rich history of the region before European settlers arrived. As you travel through the park you will find names that honor the Native Americans which called this land home, such as; Two Medicine, Running Eagle and Chief Mountain. Up, Up and Away? does an excellent job giving background information about climate change. 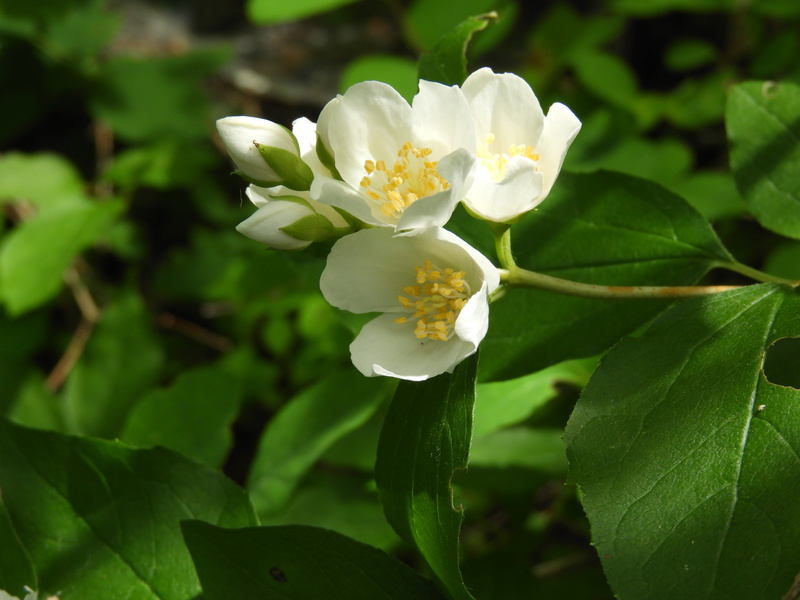 It provides an opportunity by having you write a short paragraph to explain how climate change could impact one of three animals, snowshoe hare, mountain goat or bull trout, found in the park. Four Nations Working Together has you indicate on a map of the nations and their flags, their location in this area; Canada, Flathead Nation, United States and Blackfeet Indian Nation. As you travel through Glacier National Park the rocks tell you so much about what you see, Geology Hunt has you identify unique features and list where you saw it in the park. 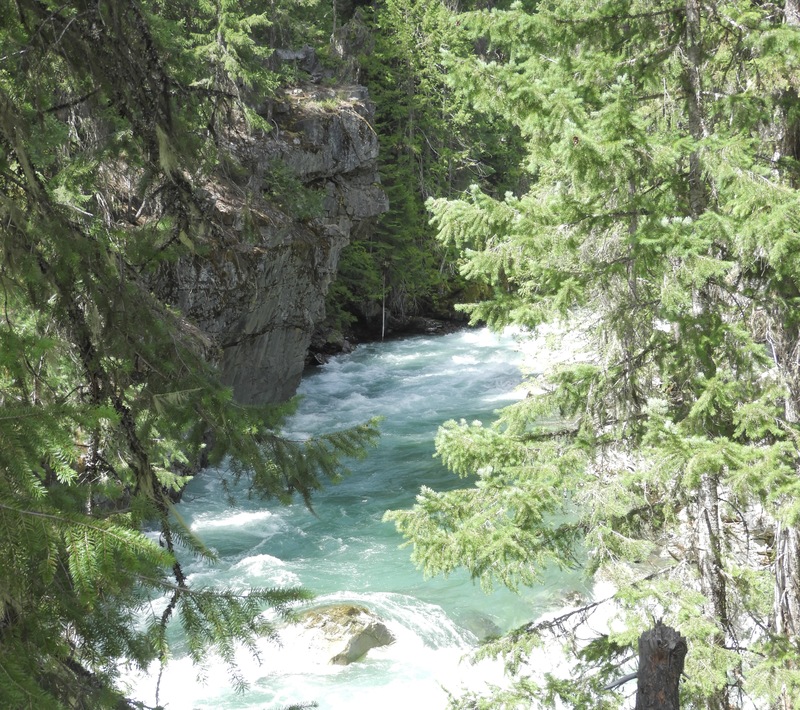 The bright blue-green water we saw along the Middle Fork of the Flathead River is created by rocks crushed by glaciers creating glacial flour. We also saw Horns, narrow rock pyramid peaks carved by glaciers, along US 2, SE of West Glacier as we drove over to Two Medicine. While camping at Two Medicine campground I finished the activities and had the booklet reviewed by Ranger Megan. I appreciated her review and discussion about my answers. She then issued the oath and the standard Junior Ranger badge. Every visit to this park brings new views, different weather, as well as a wide variety of plants and animals. I have never been disappointed when I visit, and as soon as I am leaving I am wondering when I’ll return. * As I write this, September 2017, major fires are burning around and in this park. 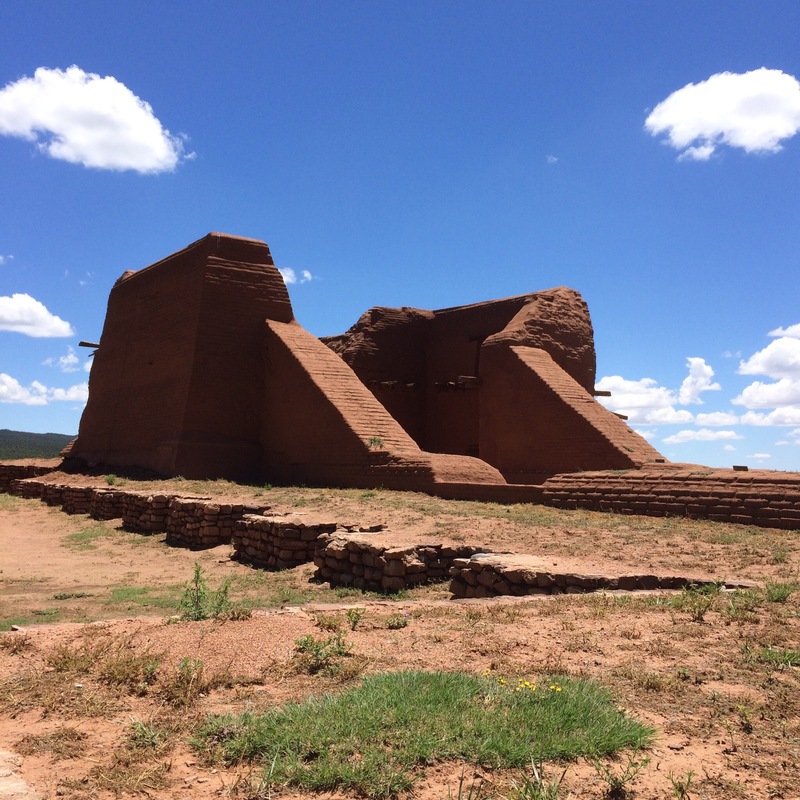 Not far from Santa Fe and just off I-25, this site quickly takes you back in time. 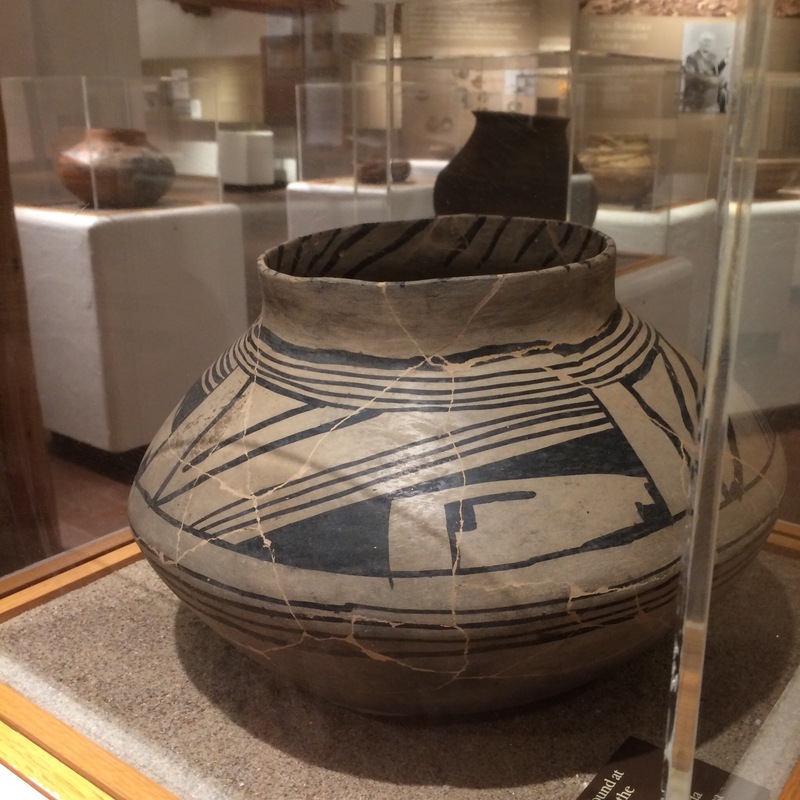 Once you enter the visitor center and the museum, behind the main desk, the ancient pots on display take you back to as early as 1300. I am always drawn to the pots here, so well displayed and explained. Once outside and walking the trail you can imagine the landscape back in the 1300s when the early Pueblo and Plains Native Americans inhabited this area. The remains of the church that you see at the end of the trail was built by the Spanish in 1717. 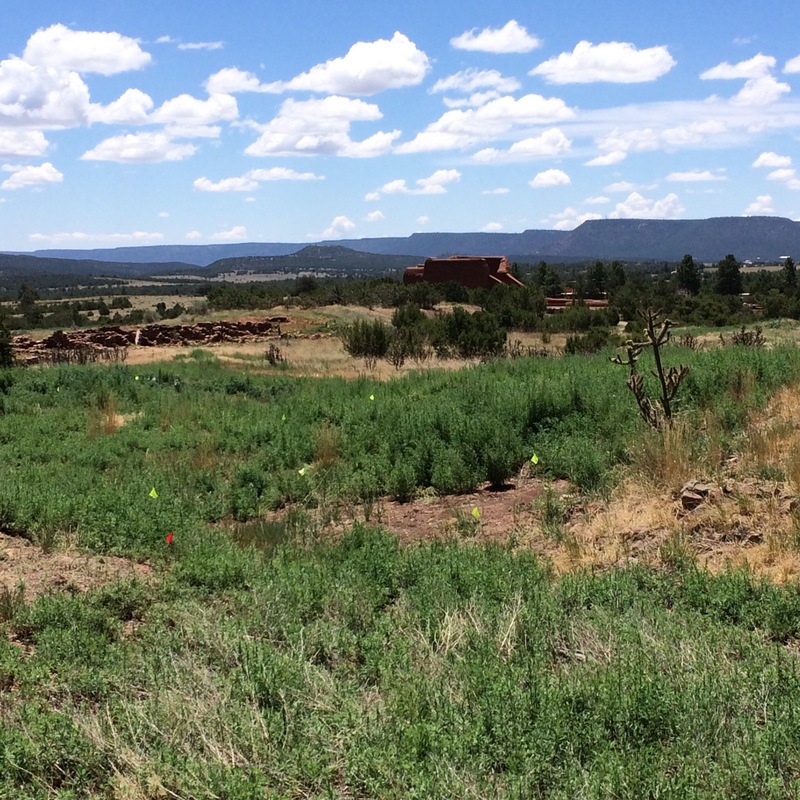 So much history has happened here; early settlers, the Santa Fe Trail, Route 66, Santa Fe Chief railway, and even a Civil War battle occurred all within the boundaries of Pecos National Historical Park. 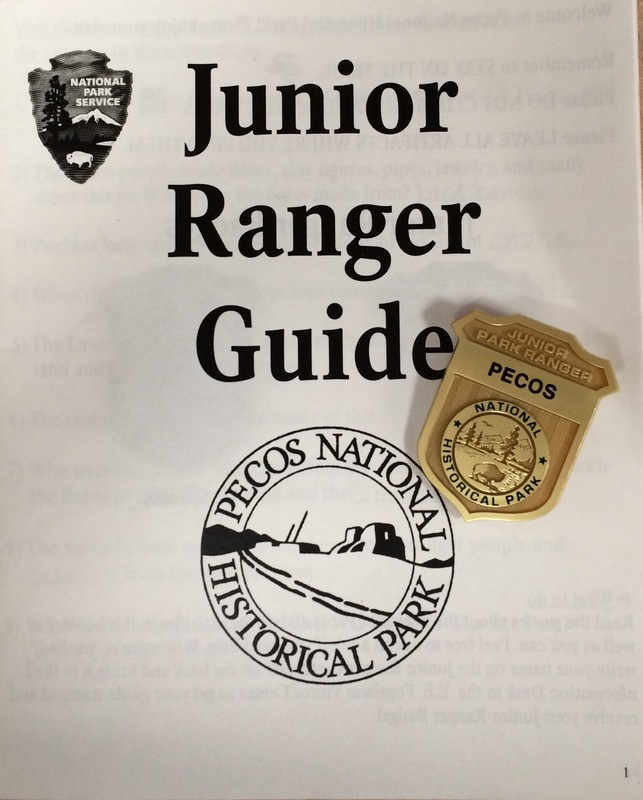 The Junior Ranger Guide has no age categories or requirements to complete to earn either the badge in English or Spanish. All that is stated is to “do the activities in this booklet as well as you can.” I was able to complete all of the activities during my recent visit. The activities are; Museum Hunt, Pottery, The Trade Fair, Little Cricket, Ruins Trail Bingo, Red Sky, Two Deer, Cristobal, Maria, Robert, Teresa, and Story Questions. The activities with names were stories about kids living at Pecos Pueblo in the past, each ending with a simple activity related to the story. I really enjoyed the Bingo activity which named nine items to look for while exploring the area and to make a drawing of the item. My drawing of a grasshopper and raven turned out OK. The Museum Hunt gave me an opportunity to look at the displays which interpret the rich history of this area. A series of 9 questions covered the time period from Paleo-Indians up to the Civil War. Before leaving the building The Trade Fair activity has you look at paintings in the Reading Room to answer some questions. The paintings were intricate and depicted everyday life in the pueblo. Once I completed the guide I took to the ranger at the main desk for it to be reviewed. Once that was done I was awarded the standard Junior Ranger badge. After many visits to this site I enjoyed completing their program. Putting together the complex history through the variety of activities was interesting. East of Seattle and reaching up to the Canadian border, North Cascades National Park, is remote and spectacular! Actually there are only a couple of places which you can step onto the actual park land, so much of the park is classified as wilderness. 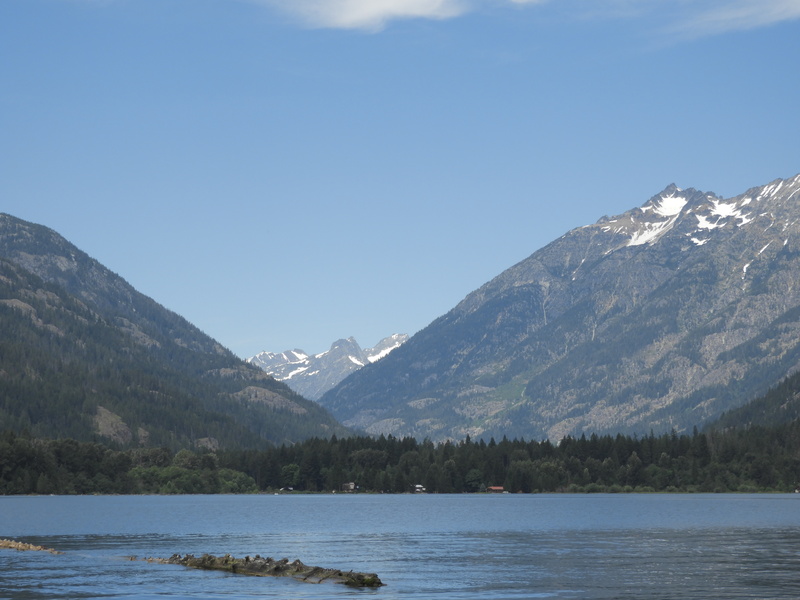 For the everyday traveler you can visit this park, or at least a visitor center, at three accessible locations; Newhalem, Hozomeen (entering from Canada) and Stehekin (arriving by boat or seaplane). On this trip I spent time at Newhalem and Stehekin over the Fourth of July weekend. There was still snow up on many peaks with water running high and fast in the lower creeks and rivers making for beautiful views and soundscape. I was fortunate to stay in Stehekin for two nights. If you ever have a chance to spend time in Stehekin, do it! It was quiet, no fireworks, and wonderful to explore this laid-back community. This program is considered Senior Friendly as the upper age group, of four, is listed for ages 12+. The groupings are; Pacific Treefrog – ages 3-5, Black Bear – ages 5-8, Raven – ages 8-11 and Mountain Goat – ages 12+. Each grouping has a theme starting with Exploration of the Natural World, Biodiversity, Cultural Awareness and Public Land Stewardship. I completed the Mountain Goat booklet which requires one place-based and five general activities. I was able to complete two place-based and all ten activities. The place-based activities included the areas of Newhalem and North Cascades Highway, Hozomeen and Ross Lake, and Stehekin and Lake Chelan. 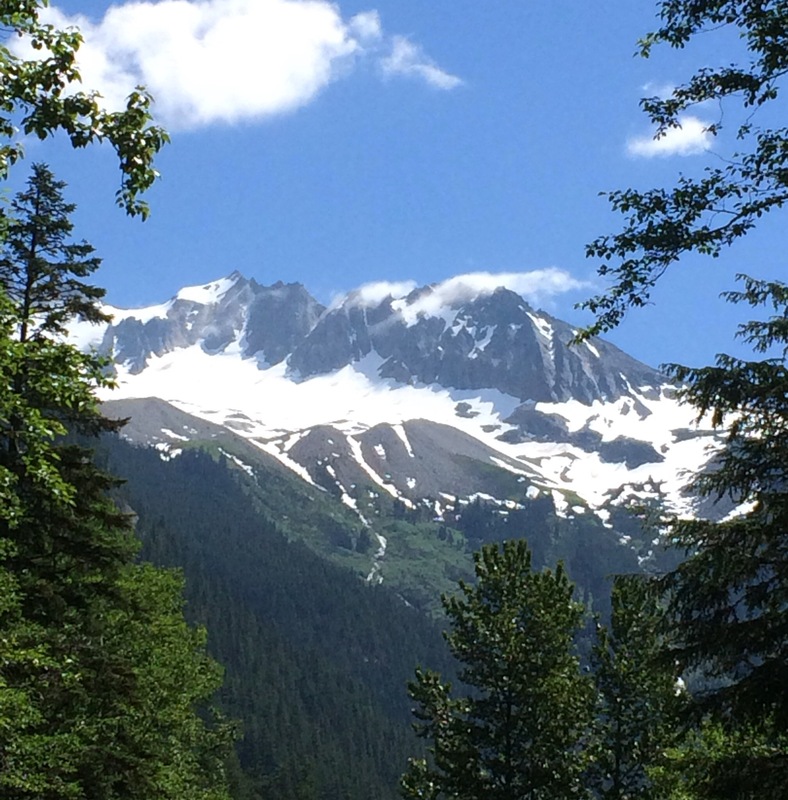 The general activities are; Learn about the North Cascades, Save the Snags, Sounds of the North Cascades, Who Am I?, Return to Wildness, Leave No Trace 101, NPS Research Part I and Part II, Field Notes and Climate Friendly Parks. 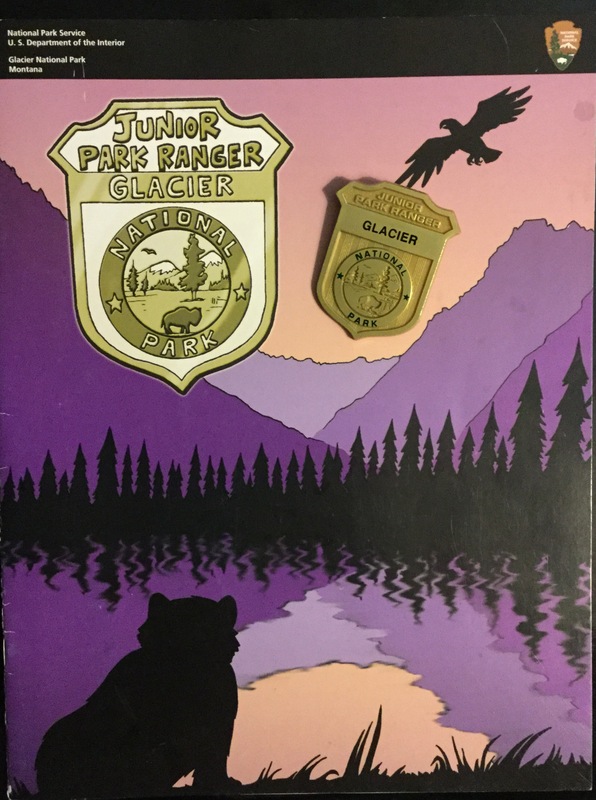 While traveling through the park stop at six locations, identified on a map on page 5, to ask for their special Junior Ranger or Cascade Explorer (for older kids) stamp. I was able to collect four of the six. kayaked across the lake one morning and was able to view the pictographs at lake level, close enough to touch, which I didn’t. The activities I enjoyed the most were Save the Snags!, Who Am I?, Return to Wildness, and Field Notes. Snags, a dead tree which is still standing, are always a favorite of mine. So many of them have ‘character’, each is unique and provides homes for wildlife. For this activity I observed a snag and drew a picture which shows the holes drilled into the snag and the plants nestled up against the snag. So many of the animals in this area are new to me, so I am always interested to learn about the animals that live here; featured were the Fisher, Wolverine, Marten and Lynx. I never saw any of these animals while in the area, but I love knowing they are out there! The Return to Wildness activity further supported that North Cascades National Park supports a large portion of wilderness which protects their wild creatures. The Field Journal activity allowed me to make observations at two areas; Newhalem campground and Stehekin. Even though it was 4th of July both sites were relatively quiet, the campground at Newhalem was full, but the sites were far enough apart that each site was quiet. While staying in Stehekin I took my completed booklet to the Golden West Visitor Center for it to be reviewed. Ranger Mark was proud of his high standards in reviewing Junior Ranger booklets, even stated that they were the PhD of programs, all in good humor! I appreciated his review and discussion about the activities I completed. Once he signed off on my booklet and presented me with an enhanced badge and patch, both depicting a mountain goat, he told me about a rare plant find. 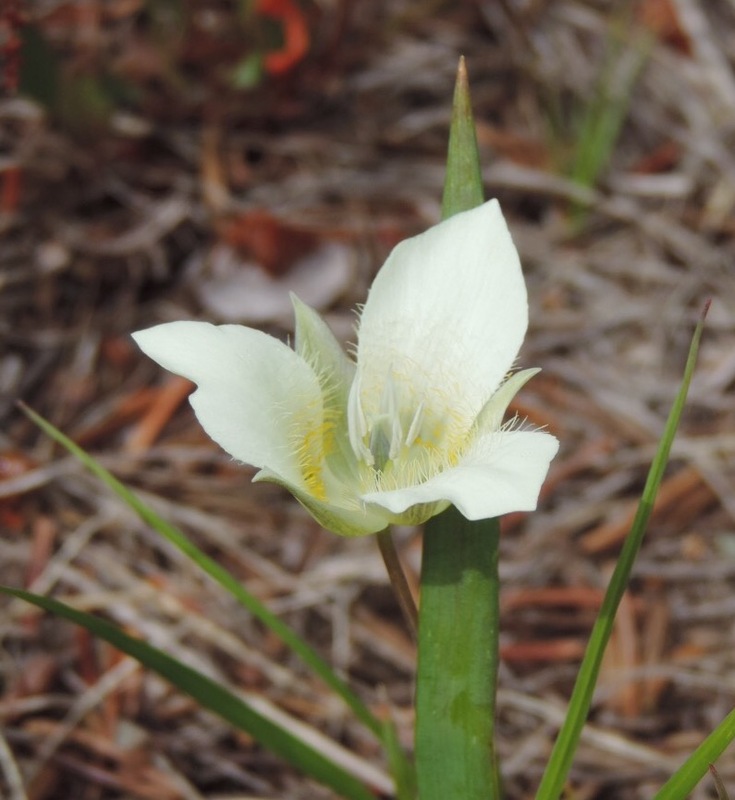 Not far from the visitor center, an orchid was blooming along the lake trail. 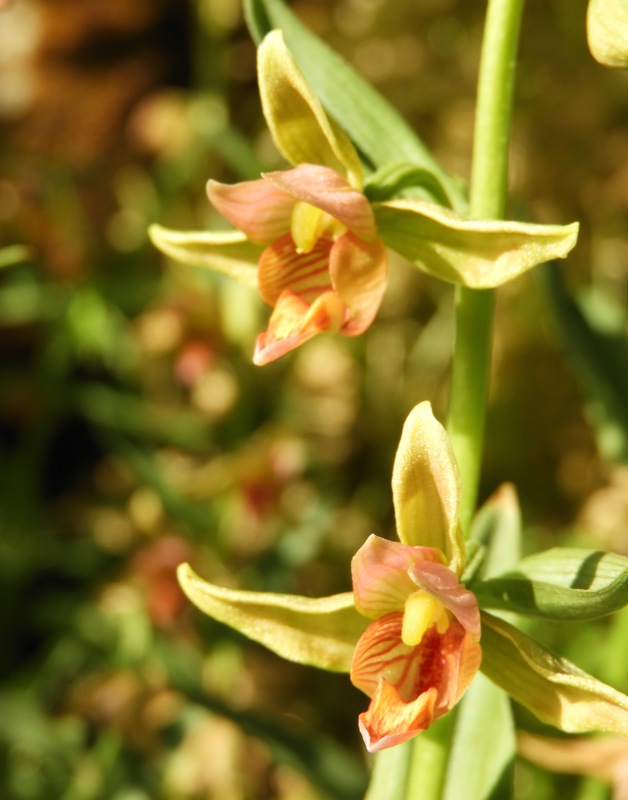 I walked up the trail which was dry and rocky, the terrain did not look promising for a blooming orchid. Just as I was about to turnaround I spotted a wet area along the trail, seeping from a rock face and a cluster of Stream Orchids (Epipactis gigantea). 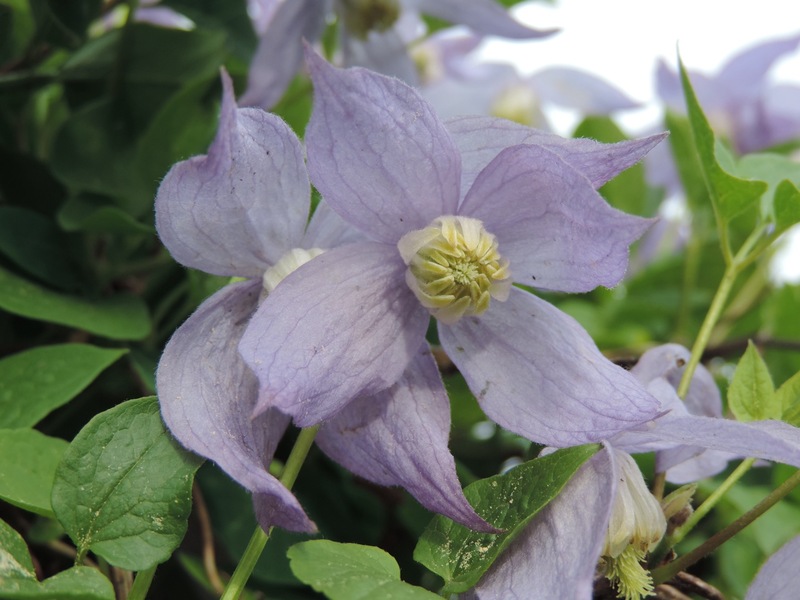 The picture below doesn’t show the ‘gigantea’ of this plant, but they stood in a dense cluster, at least 3 feet tall with numerous blooms along each stem. Yes, this is an island which can only be accessed by ferry or plane. We took the Washington State Ferry for a day visit, the weather was great. 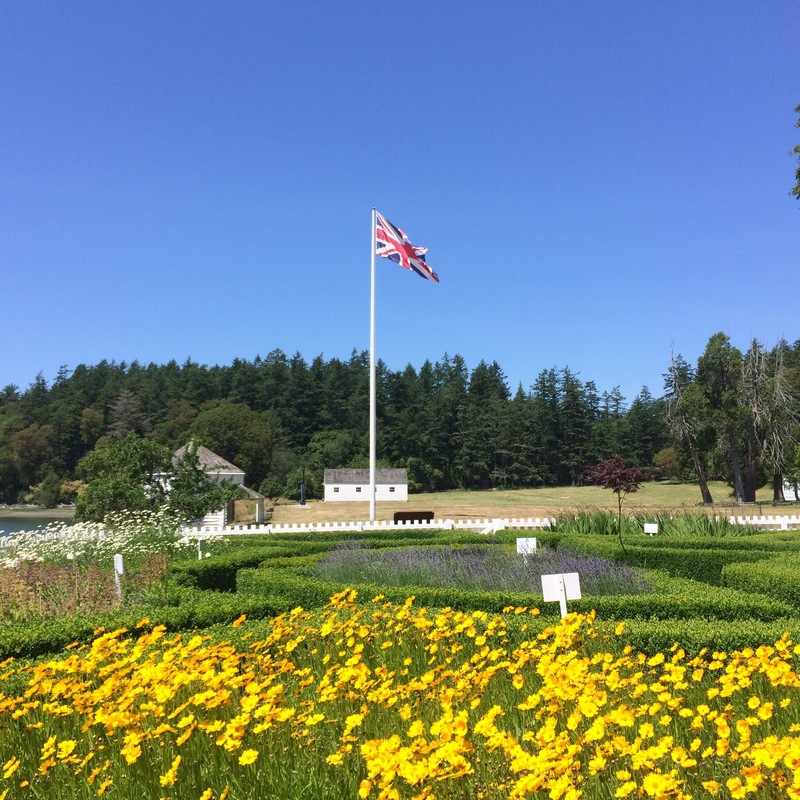 Once you arrive at Friday Harbor getting to the two sites, the American and English Camps, established from 1853-1872, takes some effort. There are several trolleys or transit companies which make stops at the two sites. The sites are on opposites ends of the island, some miles apart. We chose to rent a car for four hours which allowed us more time at each site and to explore the island. After visiting we did some price comparison and discovered it could have been cheaper to bring our vehicle out to the island. However you get there, visiting both sites is well worth your time. 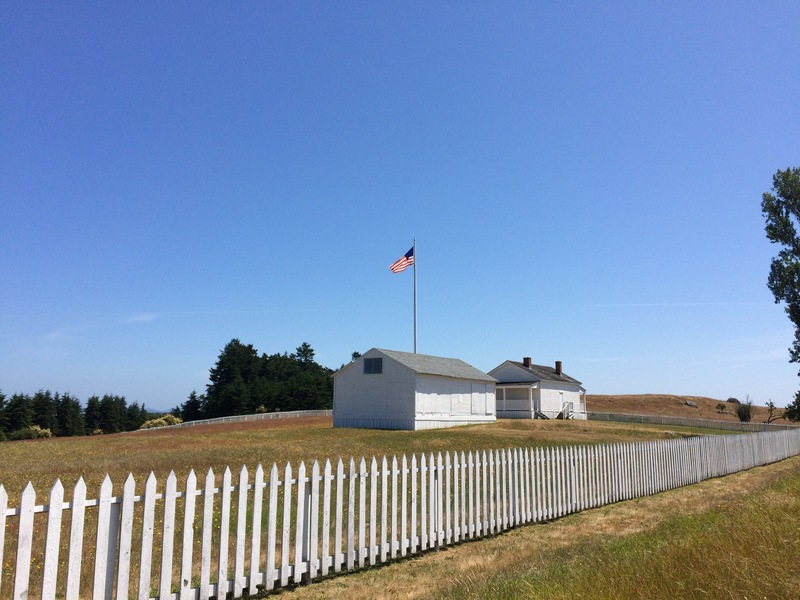 This site commemorates the Pig War; yep, a pig got shot and the American and British settlers quarreled which led to soldiers from both countries to occupy the island to protect their citizens. No shots were fired, negotiations over 12 years were resolved through a German arbitrator. Each camp is preserved and interesting to visit. complete the same number of activities as your age. There are 16 activities, so I completed all of them. The activities are; The Pig War, Creating Peace, 1860 Uniforms, Food, Archaeology, Tree Rings, Prairie Restoration, Use Your Senses, BINGO – American And English Camp, Life Zones – American and English Camp, Maze, Create Your Own Emblem, National Park Service, and Junior Ranger Quiz. What I found most interesting was the diverse environments between the two camps. The American Camp was in a less desirable area of the island, colder and wetter during the winter. The English Camp was better situated at the southern end, with a protective cove. The English-style garden was attractive. The Archaeology page was interesting, creating a table listing comparable items of Prehistoric, Historic and Modern items. As usual I enjoyed the two BINGO cards, different items to look for at each site. The ecosystem of the American Camp was primarily in the prairie and water life zones, and the British Camp in forests, down to mudflats. Some of the activities help you understand the differences. I really enjoyed the boat trip to and from the island and exploring the island by visiting the two different camps, especially with the diversity of ecosystems. The history is interesting, but the sights are wonderful. Once I completed the activities a volunteer reviewed my booklet and presented me with a standard badge and attractive patch. While visiting Olympic National Park this summer I was offered their Ocean Stewards Junior Ranger program. It is a program which focuses on the ocean environment within Olympic NP in conjunction with the Olympic Coast National Marine Sanctuary. As we were camping at Kalaloch Beach for several nights I would be able to complete the activities. Camping at Kalaloch campground was wonderful; the access to a wide, sandy beach which had plentiful wildlife to view. One of the highlights was seeing a juvenile and adult Bald Eagle while walking along the beach one morning. This program is considered Senior Friendly as there is no upper age limit. The instruction are for each person to complete the number of activities equal to their age, and those older than eleven should complete all of the activities. The activities include; Chart Your Adventure, Field Journal, Leave No Trace, One Ocean, Tidal Zones, Coastal Study Plots, Coastal Word Search, Sea Stack Maze, At Home on the Water, Sea Otters Abound, and Interview a Ranger. The Field Journal allowed me to explore Kalaloch Beach and record what I heard, saw, felt and smelled. I most enjoyed seeing the eagles and many of the animals in the tide pools. One Ocean activity provided information about marine debris that impacts animals, it included searching the beach and recording debris found. As a Desert Rat, the activities taught me a lot about the ocean, especially about the issues impacting sea life due to human interaction, both positive and negative. Learning that Sea Otters had disappeared from this area in the early 1900s, and now there are 1,000 that live in the sanctuary along the coast of Olympic National Park gave me hope for the future. I returned to the Kalaloch Ranger Station and finished the activities in the booklet by interviewing Ranger Jared about his job. He told me that in the winter it rains sideways, at times, and they had a record 140 inches of rainfall this past year. After he reviewed my booklet he gave me the very attractive Ocean Steward patch. 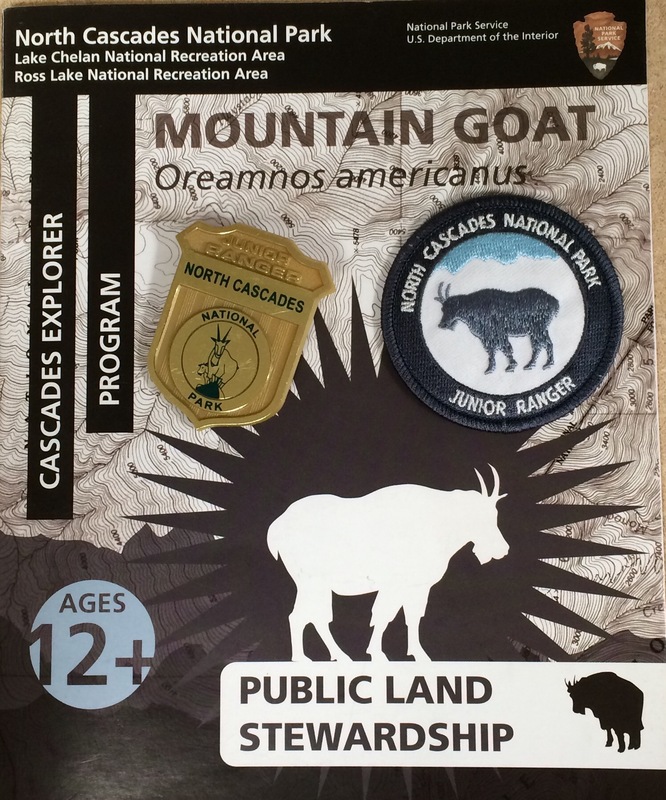 This program was a great addition to the standard Junior Ranger program for Olympic National Park. A similar program focusing on the rainforest would be interesting.